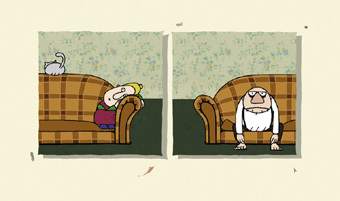 Sofa is an absurd animation film which observes through simultaneous and parallel frames the events taking place in two neighboring apartments. A woman with a cat and a man - can walls really separate worlds? Hyekung Jung was born in Seoul/Korea. After her schooling, she studied Art at the Seoul National University of Technology and worked for a design office in Seoul. She has been studying Visual Communication at the Academy of Art in Kassel since 1996. Her films include the shorts: Schlange und Frosch (1996), Hallelujah (1997), and Sofa (2001), as well as collaboration on several collective projects such as Romeo und Julia and Fenstersturz (1998), TV Animo and Nicht zuviel und nicht zuwenig (1999), Der Ueberflieger, and Chicken Kiev (1999).